At the 1972 Summer Olympic Games, American Rick DeMont won the gold medal in men’s 400-metre freestyle swimming. Brad Cooper took silver. Later, when International Olympic Committee members voted to disqualify the top medalist for using performance-enhancing drugs, they didn’t give the gold to DeMont’s assistant — or his vice president — they gave it to the runner-up, Cooper. As it should follow with the U.S. presidency. Donald Trump’s campaign will soon be found to have cheated in the 2016 election. Once he is impeached and convicted, or resigns, the presidency should not be awarded to his assistant — or vice president. It should go to the runner-up, Hillary Clinton. 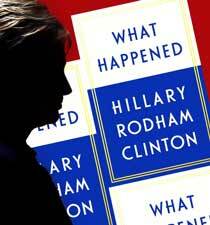 Simon & Schuster released Hillary’s new book, What Happened, Tuesday. Numerous previews and sneak peeks have been published and discussed. By now, most news and pop culture consumers know that the book outlines Hillary’s examination and explanation of her 2016 presidential loss. One of the surrounding subplots is the reporting that many Democrats, including leadership, rue the book’s release and subsequent book tour because they believe the party needs to move on. They view it as a negative distraction heading into the next election season. They don’t want multiple news cycles dedicated to excuses and sour grapes running into 2018. But really. What could she do? What would anyone else in her sensible flats do? Almost no one in Hillary Clinton’s position, having gone through what she has gone through, couldn’t not tell her story. (Ooh, a triple negative.) And she did get it out as soon as possible to minimize 2018 effects. The woman has been wronged (arguably for 25 years) as the target of massive disinformation campaigns and ridiculous but persistent conspiracy theories. I am sick of constantly hearing the qualifier that she must accept blame, too. No one runs a perfect campaign. Of course she must accept some blame. But so must all close winners, if they were to have lost. Al Franken is a genius because he beat Minnesota GOP incumbent senator Norm Coleman in 2008 by 312 votes, or 41.99 percent to 41.98 percent. If that had been flipped, you don’t think Al wouldn’t have soul-searched that result to death? You don’t think he wouldn’t have blamed the Coleman campaign’s DeHumorizer™, which presented many of Al’s old jokes and humorous writings literally, without the Franken irony, and displayed them out of context for maximum damage? And like Hillary, Mr. Franken being an author, you don’t think he wouldn’t have been compelled to respond to fair-weather fans criticizing him because he couldn’t pull out a measly 312 more votes, thereby costing Dems a filibuster-proof Senate? Unlike most other election losers (here it comes), Hillary won more votes — about 2.8 million more. Have you heard about that!? A change of only 77,000 or so votes (about 0.6 percent) in the Midwest would have given her the College — 77,000 votes out of 13 million cast in three key states. And you can multiply that unfair DeHumorizer™ handicap by a hundred. A presidential campaign is extremely complicated, and those in leadership make strategy decisions based on what they know at the time. I’m fed up with hearing she should have gone to Michigan, Wisconsin, and Pennsylvania. Now that we know Russia was helping Donald, and after James Comey’s misguided re-opening of emailgate at the eleventh hour, a hundred trips to the Blue Wall might not have made a difference. Donald Trump said repeatedly during the campaign that Hillary “doesn’t have the stamina” and “she just doesn’t look presidential.” The reasonable person knows this was his way of constantly reminding us that his opponent was a woman, the same way he regularly reminded everyone in 2012 that Barack Obama is black (probably born in Kenya). And for those sexist or closet sexist men (and some women), Trump’s dog-whistled digs at Hillary’s gender tugged at their bias. Trump told us — through these and a thousand other examples — who he is. A reasonable person knows Donald Trump is a sexist who’s not afraid to use his sexism, and to fight dirty in other ways. The Trump campaign/administration has sought to hide all its many contacts with Russia. They mendaciously denied the numerous meetings with Russian emissaries. When discovered, the administration repeatedly told more lies to explain those meetings away. When the FBI investigation was getting warmer, President Trump fired the director to stop “this Russia thing.” A reasonable person knows that for some reason Donald Trump is trying desperately to hide all things Russia from the American people. With or without the Trump organization’s help, we now know that Russian-backed actors disseminated and promoted a tremendous amount of Hillary Clinton disinformation. We’ll never know how many votes were swung. But a reasonable person knows it was a significant number. With or without the Trump organization’s help, we now know that Russian-backed actors hacked the Democratic National Committee’s and Clinton campaign operatives’ email accounts, and leaked embarrassing but unimportant internal communications — the types of communications any political campaign has and would want kept private. The funny thing is they also hacked the Republican National Committee, but only leaked Democratic emails. A reasonable person knows this effort was coordinated to help the Trump campaign. Eleven days before Election Day, Hillary was up by double digits, and FBI director James Comey wrongly re-opened her email server affair. By Election Day, though vindicated, she was down to low single digits. A reasonable person can see the late-campaign Comey actions cost Clinton oodles of votes. Brad Cooper ultimately got the Olympic gold medal he deserved. Now it’s almost time to give Hillary the presidency. A reasonable person can see that if you eliminate the cheating and FBI mistakes, she won. After eight months of Trump in office, we know that competence, intelligence, maturity, experience, and integrity count for something. And Donald has realized he can’t build a successful administration on a steady diet of narcissistic prevarication and reality show shenanigans. Did I mention he’s dangerously incompetent? OK, the presidency is not a gold medal. When Donald Trump ultimately is forced out of office due to obstruction of justice, collusion with Russia, financial corruption, criminal nepotism, felonious narcissism, or plain old incompetence (25th Amendment? ), Mike Pence will be our president. If Pence is too tied to the Trump mess, Paul Ryan will be the guy. Either one will be a poor choice but still miles above President Trump.